A small group of hardware and software engineers put together a prototype of a new kind of pda - one that completely used voice, with no stylus, and no display. What we found about people's use of PDAs was surprising, and showed a market gap still waiting for a commercial solution. A wireless, voice-controlled pda. Crazy? or Visionary? When we began the metabadge project and started to show the prototype, a frequent question was, "Why doesn't it have a display". The answer is simple - you don't need one. Am I free Thursday at 2:00? "Book an appointment, Friday at 10:00, Meet to discuss online help"
What is Dan's phone number? metabadge enabled anyone who could speak or listen to answer these questions with as little as one button click. That's simplicity. That's ease of use. 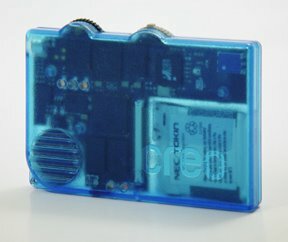 The Creo metabadge - Top things people want from a PDA - without a display. Size - PDAs are too big to carry everywhere. If it's sitting on the desk, it's not personal enough. Sync - Care and feeding of a PDA was a leading reason to not use them after a few months. Simply too much bother to cable up and sync. Complex - More features meant more clicks to do anything at all, even simple things. Simple - one click tells you the time, and your next (or current!) appointment. Creo's metabadge prototype was demonstrated publicly in 2002, but not commercialized. Yet.